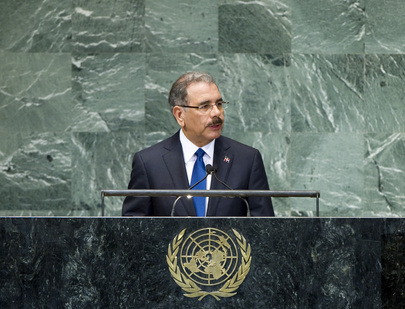 DANILO MEDINA SÁNCHEZ, President of the Dominican Republic, said the global financial crisis had been caused by the lack of application of effective regulations on the international financial system, as well as by arrogance, greed and the unbridled urge to accumulate wealth. Thus, the old debates had once again arisen. The economy must be made to serve people, and not the other way around. In the debate on development, it should be reaffirmed that equity and sustainability were essential prerequisites to sustained and sustainable economic growth. However, economic growth alone would not reduce social inequalities or improve quality of life; nor was it correct to sacrifice populations in the hope that the benefits of economic growth would eventually spill over to all and reduce social inequalities. Experience had shown that healthy economic growth could be stimulated by improving the quality of life and by reducing poverty and social exclusion. Moreover, economic growth that did not take into account the limits of nature and the needs of future generations risked imminent collapse. He said it was time to rethink the ideas about development that had predominated in the international financial system. Equity and sustainability were two sides of the same coin needed to fund human development. Development implied environmental protection, as that would increase production and reduce social inequality as a way to elevate quality of life for all. He issued a plea for investment to afford youth the opportunities to creatively confront the challenges that define societies today. By recent measurements, his country had been classified as upper-middle-income. However, more than one third of its citizens still lived in poverty. “How is it that countries like our own are excluded from development assistance?” he asked. The optimism of international estimates were not in line with the perception of many citizens who felt that the growth in gross domestic product (GDP) had done nothing to lessen their sense of despair. As for youth, he said that despite higher education levels, they were not finding decent jobs or business opportunities. The discrepancy between the optimism of various international measures and the discontent on the streets was due to the use of inadequate indicators to measure poverty, development and well-being. In the Dominican Republic, it was difficult to support the idea that quality of life, and the chances to improve it, for a person living on less than $2 a day, or even for those living on $3 or $4 per day, differed significantly from someone else whose income was a few cents less. Assumptions about poverty and underdevelopment had led to social policies limited to assigning or transferring resources to temporarily raise the incomes of impoverished families above the so-called “poverty line”, sacrificing development of more effective systems of public services, which everyone had a right to access. Poverty was a multidimensional phenomenon requiring a systematic approach that led to increasing capabilities, freedom and opportunities for those who had been traditionally excluded, he said. Developing countries should assume their share of responsibilities and should improve their information systems so as to increase awareness of social, territorial and gender inequalities, and impacts on nature. Likewise, they must redirect their investment patterns and public policies, for which international support was needed. “It cannot be accepted that a country would no longer receive development assistance just because its average national income has risen beyond a certain arbitrarily defined threshold,” he said. He called on international financial institutions to employ “more enriched” indicators with a greater capacity to capture and measure the complex and dynamic nature of human development. That meant working together to overcome exclusivity and not to maintain poverty and extreme poverty indefinitely.